Fiot was a very talented sculptor and created several models of dogs, horses, and wild animals. His style is realistic yet simple with clean lines verging on the Deco style. Here is a superb portrait of a Greyhound dog resting after a hard run. Greyhounds are the fastest dogs and these powerful dogs are often shown in art due to their athletic build. The Greyhound is stretched out with his mouth open as he pants. 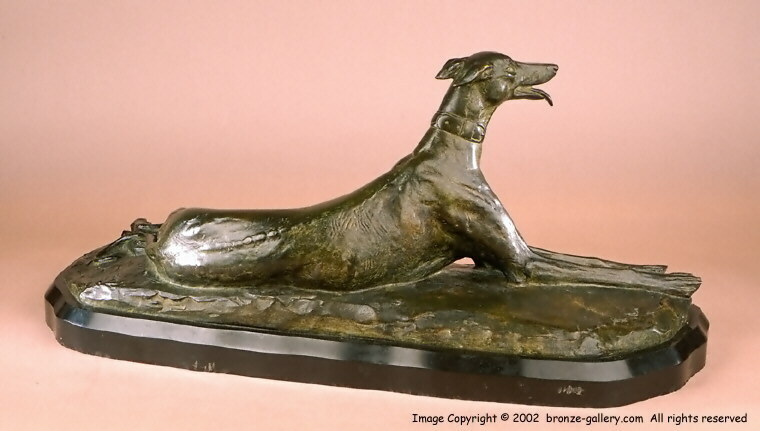 A wonderful sculpture of a racing Greyhound at rest, this is a rare model. It is a large bronze measuring almost two feet in length, and it is beautifully modeled. This fine sculpture is finished in a multi colored black, brown, and green patina, it is mounted on the original black slate base. 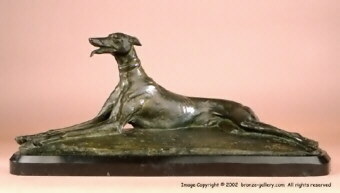 This large bronze Greyhound is priced very reasonably. A Foit bronze in a similar size of Panthers was sold at Christies NY in June 2011 for $17,500.00 USD and our Greyhound is much less.